After coming up with a list of priorities and going thru many brainstorming sessions, we have finally reached a Preliminary Floorplan. It has taken many iterations of back-and-forth to agree that we both like this plan. To incorporate the sloping of our lot, we have designed a split-level house. Another tricky element about this property is the multiple boundary lines we have to be mindful of in our design. There is a 15′ P.U.E. running diagonally across our lot (dimensioned below at 63’2″). Another utility line (dimensioned at 43’5″), despite not being shown as an easement on the plot, could potentially be flagged during the permit review, so we are designing around it as well . Of course, we also have a side-setback 10′ from our property line (dimensioned at 70’3″). Finally, the rear-setback is 20′ from our property line (dimensioned at 34’0″). However, as shown below, we are not held to the rear setback according to the neighborhood HOA’s, since we back up to a bluff. The final dimension of 56’0″ is simply completing the “pentagonal” shape that we are tasked with fitting our house into. The garage is at the lowest level, and the mudroom is 1′ up from the garage. To the right of the mudroom is a set of stairs to provide access to the entryway, elevated another 3′, as well as the Master Bedroom. Attached to the Master Bedroom is, of course, the Master Bathroom, then a 1′ drop to the Walk-in-Closet with a potential secret door to the Guest Bedroom (possible Future Nursery). To the left of the mudroom is the kitchen, living room, and dining room which are all on the same plane. 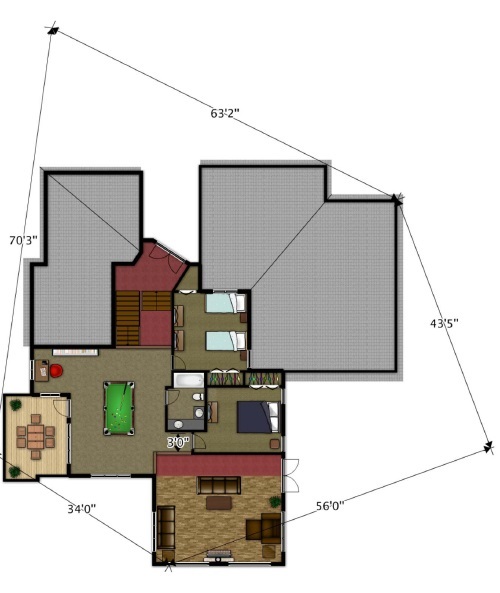 The Guest bedroom and bathroom are elevated 2′ from the main living spaces. Also accessible from the entryway is another set of stairs leading to the 2nd level – with another two bedrooms, bathroom, and living space, in addition to a covered patio. There will be an open-railing on both sides of this space – overlooking the entryway and living room below respectively. I do have some concerns with the fact that there are so many stairs! I have been known to injure myself of steps, from entire stairways, to simple curbs. Another on-going point of discussion is whether to include a sauna in our Master Bathroom. Regardless of these pending decisions, we are moving forward at a steady pace. I love the way the house will look from this perspective coming down the driveway. 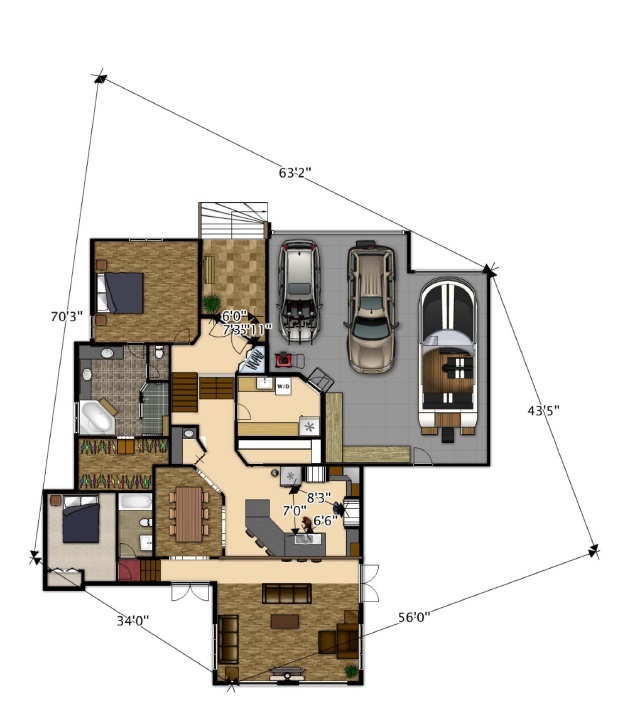 We are almost ready to submit these Preliminary Floorplans to an Architect to have them drawn into AutoCad. Meanwhile, we pushed our closing date (which was scheduled for today actually) to August 19th because the Seller has not completed the survey as per our agreement. This was also beneficial to us since we are supposed to close on selling our house on August 16th – if everything goes according to plan unlike last time. Fingers crossed! An update on selling our house in Houston: we received our first offer in June. It was a low-ball offer, but we counter-offered in hopes of a mutual compromise. The prospective buyers continued playing hard ball. In fact, they walked away when we didn’t accept their counter-offer in the 2nd round of negotiations. In a moment of desperation, we reconsidered and decided to accept their counter-offer. During the 10-day option period, we began working on the buyer’s requested repairs. 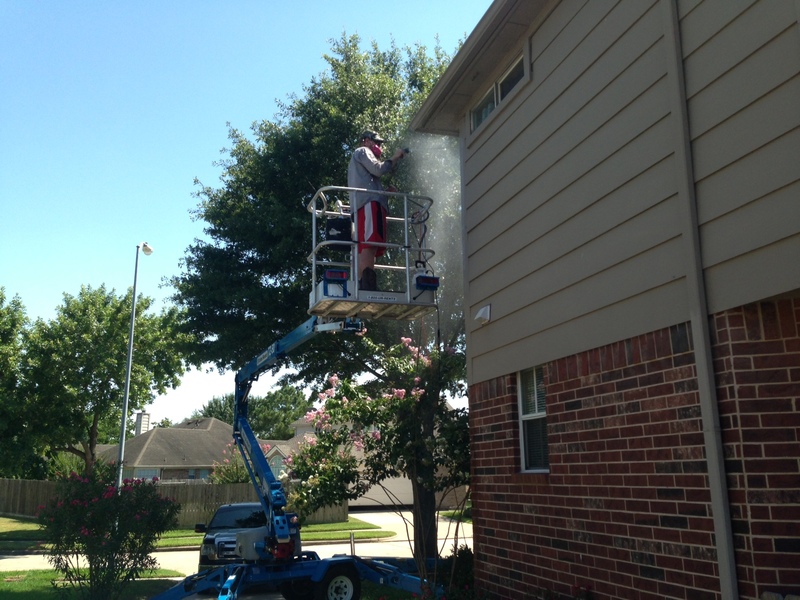 This included renting a boom lift and spending an entire weekend in the 100 degree heat & Houston humidity, scrubbing the brick with muriatic acid to remove the paint overspray along the eaves due to the previous owners’ painter’s laziness. Several other repairs were requested after the buyers received their inspection. The big ticket item was the upstairs HVAC unit. The inspector noted its age (19 years), deemed it a fire hazard, and stated that it needed replaced. He reported “excessive noise and vibration” and proceeded to turn our A/C OFF without our permission. Since this was during the heat of the summer, and we were 3 hours away, we were HOT, pun intended! The buyers were convinced that the HVAC unit had to be repaired/replaced upstairs, although to us it seemed the only issue was noise/vibration. They also were requiring us to replace the flex gas lines (which was not a code issue, but possible safety concern). We struggled with spending more money on items that were functioning! In fact, the inspector had noted in his report that the A/C units were still functioning and cooling properly. There was a bit of a disagreement here because we did not feel obligated to fix items that were still technically working. But then as luck would have it…the fan motor went out. Remaining optimistic that our home warranty would cover the repairs, we had a service tech come out to diagnose the issue. More bad news: the warranty didn’t cover the repair. The original fan motor had been replaced (by us) and was not the specified unit. Prepared to negotiate with the buyer, we offered to pay for the half of the repair. They wouldn’t budge. Finally, we agreed to go ahead with the repair – in attempt to keep the sale. Unfortunately, it wasn’t good enough for the buyers, and they backed out on the last day of their option period. Our house is back on the market now. In addition to reducing our sales price, we actually decided to sink $2,000 into a new HVAC system for the upstairs instead of spending $800 to repair it. With all the repairs complete, a new upstairs HVAC, and a lower sales price – our hope is that we can lure new prospects into a quick & agreeable offer!